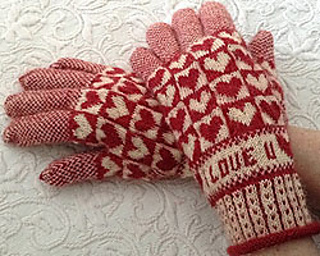 These Sanquhar gloves follow the theme of Valentine’s Day, with contrasting knit stitches making tiny hearts in the corrugated ribbing cuffs and motifs in the hands of hearts too. These gloves are designed as the original gloves of Sanquhar in Scotland were done in the mid 1800s to present day, with thumb gussets and finger gussets, and “I Love U” in the upper cuff. The main motif will look great in pink or red or maroon and will be a lovely gift for a loved one, or for yourself! Men may prefer a maroon, dark green or navy with grey. Kits are available in my Etsy store. If you have purchased the pattern here on Ravelry and want the kit, choose the option “without Pattern” so you don’t pay for the pattern twice. The gauge is very individual. 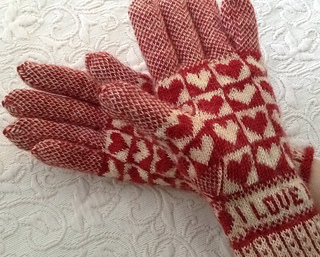 Sanquhar gloves have a static architecture–that is, ll the sizes use the same number of stitches. You vary the needle sizes and yarn weights to achieve the size glove you want. 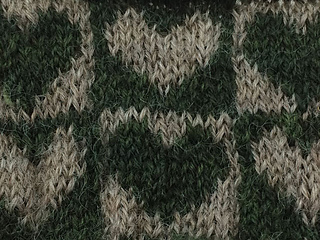 Because of this, IT IS ESSENTIAL to knit the gauge swatch. I also have a DVD about Sanquhar Gloves in my Etsy store, that can guide you through the process of knitting them, if you would like extra help along the way. But the pattern explains everything.